The information on this site is being merged and integrated (just like us!) over to the newest site, Awakening To Remembering. This energy is one of Remembering, as is all we are here for/to do. 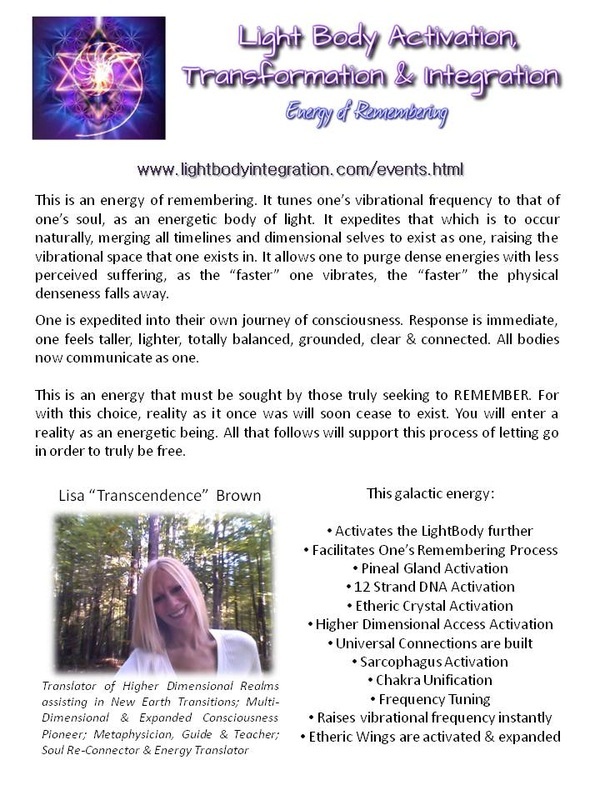 This information on the LightBody, the actual energy is really important and a huge part of what is going to assist many in catapulting into their expanded energetic multi-dimensional GALACTIC self. Workshops and teaching encompass the full gammit. So we shall teach and share via the new site to embody more as one. This ENERGY is REMEMBERED and is to assist others in the same. This "Energy" activates, merges, integrates and raises one's vibrational frequency in every way, providing instant access to higher dimensional realms & frequencies. This opens portals within, removes blocks energetically and tunes one's overall frequency as one. It is an actual energy that has "come through" here to assist others in expediting their own ascension process by raising their entire vibrational frequency. It's like the "Energetic Chiropractor" plugging you into an electrical outlet, while releasing "low" vibrations during and after the session(s). Your vibration speeds up, your internal world gains clarity, new connections are created which allows for expansion all at the same time! 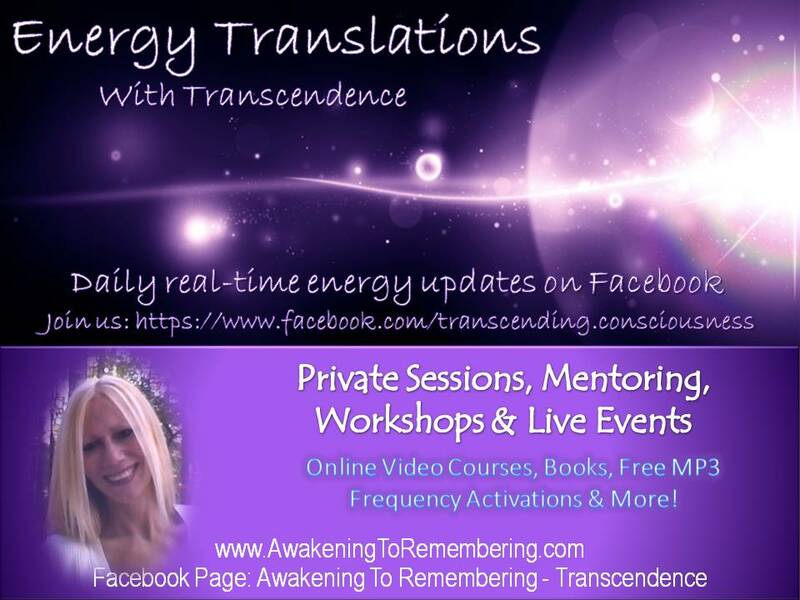 This website is geared towards one who knows there is more, seeks to raise their own vibrational frequency with greater ease, truly understands that they are energetic beings, and desires to embrace and integrate to higher frequency/realm energies from within. This is an energetic tool that expedites one's own integration process/journey/evolution. This is for the soul seeker of infinite knowledge and expanded abilities from within. The LightBody is a body of consciousness. It is your soul, your higher self, your spirit integrated here in the physical, WITH you, AS you. As you ARE it, you have just forgotten. It is YOU as a BEing of Light, not as your previous human self, yet your NEW Lighter Self, one of the highest vibrational frequency there is. It is your ability to transcend and exist as a multi-dimensional being here, where all dimensions merge into one. One that you access from within vibrationally. One that expands out. One that is unlimited. One that you have always been. It is you, as one, with all that is. And re-evolving is what all are doing now. Whether one is aware of it or not. When one's light/soul energy is activated, things immediately look different. There is new clarity & things are more expansive. One see's through new eyes and their energy body is immediately present. Many "float" when they walk, have new wings to assist in their journey to fly. One cannot fly and hold on to the physical. One must choose to let go to avoid the "disruptions" that occur in this entire process of remembering. Learn how to do this with greater ease and flow AS the Energetic self that you are! Print & Digital Download Version Available. Links on Book Page.